Wisconsin Republicans moved quickly Monday with a rare lame-duck session that would change the 2020 presidential primary date to benefit a conservative Supreme Court justice and weaken the newly elected Democratic governor and attorney general. 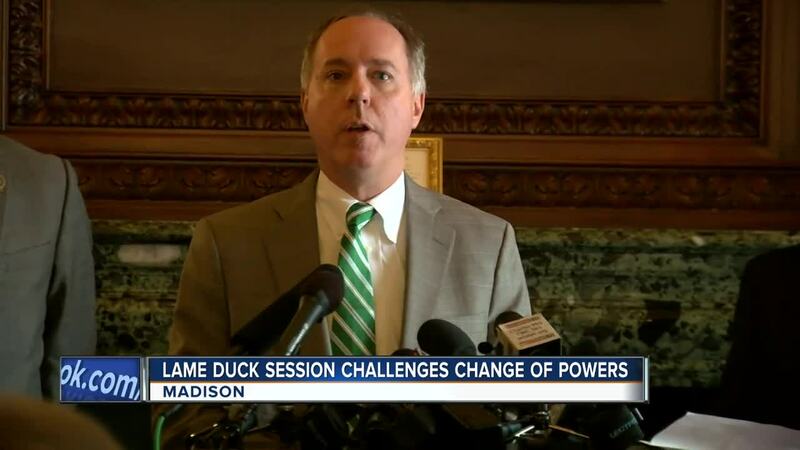 MADISON, Wis. (AP) -- Wisconsin Republicans moved quickly Monday with a rare lame-duck session that would change the 2020 presidential primary date to benefit a conservative Supreme Court justice and weaken the newly elected Democratic governor and attorney general. The changes being sought would shift power to the GOP-controlled Legislature and allow outgoing Republican Gov. Scott Walker to make one last major mark on the state's political landscape after he lost re-election in November. 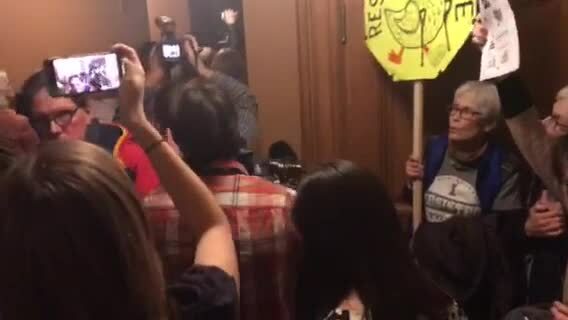 Angry opponents filled the hallways of the Wisconsin Capitol, and the hearing room, banging on the doors and chanting "Respect our votes!" and "Shame!" The protests, coming at the end of Walker's eight years in office, were reminiscent of tumult that came shortly after he took office in 2011 and moved to end collective bargaining powers for public sector unions. In addition to moving the primary date, the proposals would weaken the governor's ability to put in place rules that enact state laws and shield the state jobs agency from his control. Other measures would weaken the attorney general's office by allowing Republican legislative leaders to intervene in cases and hire their own attorneys. A legislative committee, rather than the attorney general, would have to sign off on withdrawing from federal lawsuits. That would stop Evers and incoming Democratic Attorney General Josh Kaul from fulfilling their campaign promises to withdraw Wisconsin from a multi-state lawsuit seeking repeal of the Affordable Care Act. Republican Senate Majority Leader Scott Fitzgerald downplayed concerns about what was being considered in the lame-duck session, saying "I don't think it's outrageous at all." "But listen, I'm concerned," he said. "I think that governor-elect Evers is going to bring a liberal agenda to Wisconsin." Fitzgerald wouldn't say whether there was enough support among Republicans for moving the 2020 presidential primary date, a change that would cost about $7 million and has drawn opposition from nearly every county election official. Fitzgerald said last week that Republicans want to move the 2020 presidential primary, when Democratic turnout is expected to be high, so it won't be on the same date as an April election where Walker-appointed Supreme Court Justice Dan Kelly is on the ballot, thereby improving his chances of victory. The state Elections Commission unanimously adopted a motion Monday declaring that the shift would be "extraordinarily difficult" and costly without additional funding. Commissioner Mark Thomsen, a Democratic appointee, called the plan "the biggest waste of money for a single person that I can think of" during discussion preceding the vote. Evers decried the lame-duck session -- the first in Wisconsin in eight years -- as an embarrassment and an attempt to invalidate the results of the November election where Democrats won every constitutional office, including governor and attorney general. "It goes to the heart of what democracy is all about," Evers said at a Sunday news conference held at a Milwaukee law firm. "I think it's the wrong message, I think it is an embarrassment for the state and I think we can stop it." The executive director of One Wisconsin Now, which filed the lawsuit challenging the previous attempt to limit early voting, said the Republican's latest effort shows they "refuse to accept the results of the 2018 elections" and are worried about large voter turnout. "It's a power grab," said Democratic state Sen. Jon Erpenbach. "They lost and they're throwing a fit." Erpenbach said expected legal challenges to what is passed could "grind things to a halt" in the Legislature for as much as a year.